With the passing of Lawrence Peter Berra at age 90 after a life well lived, all kinds of tributes, memories, flashbacks about the man continue to surface. I actually met up with him in the Astrodome, in Shea Stadium, and at Yankee Stadium. Three times. I wore the laundry tag media identification that set me apart from the regular working press. Nevertheless, Yogi was pleasant, interested and respectful–curious about my writing project that day. It was unusual for a star of his magnitude to be that way. I always remembered it. I am sure he remembered “the Harmonica Incident” of August 20, 1964. Despite a string of four straight pennants, the Bronx Bombers were a bust throughout much of the 1964 season. 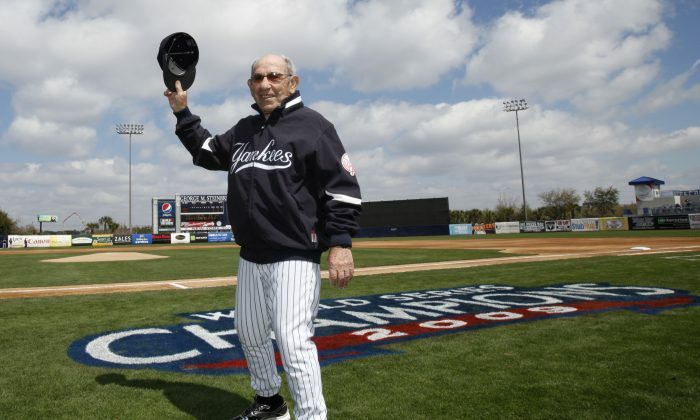 Yogi Berra had succeeded Ralph Houk as skipper; there were reports that he got more laughs than lauds from his players. It was getting to be late August; the Yankees were in third place behind Baltimore and Chicago. The Yankees were on the team bus heading to O’Hare Airport, losers of four straight to the White Sox, winless in 10 of their last 15 games. A 5–0 shutout at the hands of Chicago’s John Buzhardt had totally demoralized them. Phil Linz, #34, reserve infielder, a career .235 hitter was a tough, aggressive player who loved being a Yankee. But he was regarded by some to be un-Yankeelike along with teammates Joe Pepitone and Jim Bouton. But Linz barely heard him. When asked what their manager had said, Mickey Mantle said, “Play it louder.” Linz played louder. “I told Yogi that I didn’t lose that game,” Linz related. Berra smacked the harmonica out of Linz’s hands. The harmonica flew into Joe Peptone’s knee and Pepitone jokingly winced in pain. Soon the entire bus—except for Berra—was enjoying the comic relief. Linz was fined $200—but as the story goes received $20,000 for an endorsement from a harmonica company. Actually, the whole thing changed things around for the Yankees. The summer of 1964 was Linz’s most productive season. Injuries to Tony Kubek made the “supersub” a regular: Linz started the majority of the games down the stretch, and every World Series game at short. Dr. Harvey Frommer is in his 39th year of writing books. A noted oral historian and sports journalist, the author of 42 sports books including the classics: best-selling “New York City Baseball, 1947-1957″ and best-selling Shoeless Joe and Ragtime Baseball, his acclaimed Remembering Yankee Stadium was published in 2008 and best-selling Remembering Fenway Park was published to acclaim in 2011.